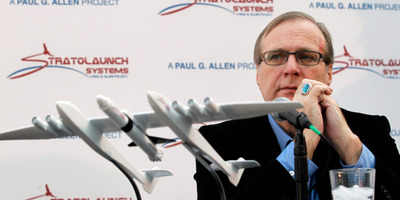 Elaine Thompson / Associate PressMicrosoft co-founder Paul Allen looks across at a model of the giant aeroplane and spaceship he’s currently building. The “Stratolaunch,” the world’s largest aeroplane, is 76 per cent complete. Originally announced by Allen in 2011, the plane has “beyond-Earth ambitions”: it’s designed to carry a rocket to 35,000 feet. At that height, the rocket (which is tethered to the plane) will “air-launch” into orbit. So far, no set date for the plane’s first flight has been revealed — and, according to the Post, the plane still needs to go through a ground-testing program — but Allen’s Vulcan Aerospace is on track to launch rockets by the end of the decade.